To conduct their study, researchers will record the electrophysiological signals from neurons in actively behaving fruit flies and record and manipulate neuronal activity while the flies make decisions. The study’s aim is to understand how genes, through their effect on cellular electrophysiology, affect decision-making. The researchers hope their work will eventually lead to better drug design for human mental illness. In addition to receiving this latest research grant, Rockefeller University receives a great deal more funding from the NIH and NSF. Lab suppliers marketing life science products and working to sell lab equipment in New York may also be interested in the following funding statistics: In 2012, the NIH gave Rockefeller University $70.1 million. For a full list of departments receiving NIH funding organized by department name, number of awards received and total funding awarded, please visit the NIH website. Rockefeller University also received $844,385 from the NSF in 2012. For a full list of projects receiving NSF awards, please visit the NSF website. Biotechnology Calendar, Inc. invites all lab suppliers working to market their life science products and sell lab equipment at New York life science marketing events to attend our Rockefeller BioResearch Product Faire™ Event on October 2nd, 2013. 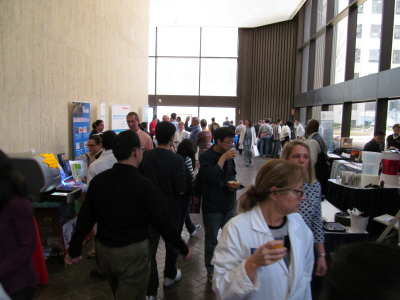 Last year, the Rockefeller BioResearch Product Faire™ Event attracted 398 attendees. Of the attendees, 102 were purchasing agents, professors and post docs, and 22 were lab managers. The visitors came from 28 different research buildings and 77 departments across campus. Biotechnology Calendar, Inc. is a full-service science research marketing and events-planning company that organizes life science marketing events at top research institutions nationwide. If you’d like to market your life science products and sell lab equipment at other life science marketing events closer to home, we encourage you to view our 2013 calendar of events. For more information on our Rockefeller BioResearch Product Faire™ Event, or to view more funding statistics for Rockefeller University, click on the button below.